A while back I wrote three post on cooking with acorns. Cooking with Acorns is easy, Uses of Acorns and Acorns. These articles show you how to cook with acorns and some of their other uses. Besides being edible, the tannic acid you wash out of the acorns is useful. The Native Americans used acorn flour to make a type of flat bread, mush and soups. Acorn flour makes unleavened bread since it has no gluten. It can be used to make leavened bread, but must be mixed 50/50 with wheat flour. Since acorn flour is high in oil it needs to be stored carefully and not be allowed to go rancid. 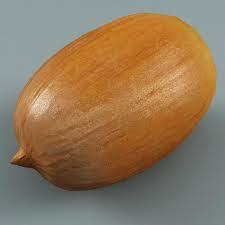 Acorns in the whole shell will keep for several years if properly stored. Protect them from insects and varmints. Acorns are quite nutritious. For example, the nutritional breakdown of acorns from the white oak is 50.4%carbohydrates, 34.7% water, 4.7% fat, 4.4.% protein, 4.2% fiber, 1.6% ash. A pound of shelled acorns provides 1,265calories, and roughly 100 grams of oil. During World War II Japanese school children collected over one million tons of acorns to help feed the nation as rice and flour supplies dwindled.